In this tutorial, you will develop a simple TCP "greet" server. Clients are meant to connect to it by telnet. After a client has connected, the server will ask for their name, reply with a greeting, and then proceed to close the connection. Throughout the tutorial, you will learn how to use coroutines, channels, and sockets. Now we can move on to the actual interesting stuff. The ipaddr_local() function converts the textual representation of a local IP address to the actual address. Its second argument can be used to specify a local network interface to bind to. This is an advanced feature and you likely won't need it. For now, you can simply ignore it by setting it to NULL. This will cause the server to bind to all local network interfaces available. The third argument is, unsurprisingly, the port that clients will connect to. When testing the program, keep in mind that valid port numbers range from 1 to 65535 and that binding to ports 1 through 1023 will typically require superuser privileges. If tcp_listen() fails, it will return -1 and set errno to the appropriate error code. The libdill API is in this respect very similar to standard POSIX APIs. Consequently, we can use standard POSIX error-handling mechanisms such as perror() in this case. As for unlikely errors, the tutorial will simply use asserts to catch them so as to stay succinct and readable. The function returns the newly established connection. Its third argument is a deadline. We'll cover deadlines later on in this tutorial. For now, remember that the constant -1 can be used to mean 'no deadline' — if there is no incoming connection, the call will block forever. The source code for this step can be found in the libdill repository as tutorial/step1.c. All the steps that follow can be found in the same directory. Everything seems to work as expected. Let's now move on to the step 2. Note that hclose() works recursively. Given that our SUFFIX socket wraps an underlying TCP socket, a single call to hclose() will close both of them. Note that msend() works with messages, not bytes (the name stands for "message send"). Consequently, the data will act as a single unit: either all of it is received or none of it is. Also, we don't have to care about message delimiters. That's done for us by the SUFFIX protocol. To handle possible errors from msend() (such as when the client has closed the connection), add a cleanup label before the hclose line and jump to it whenever you want to close the connection and proceed without crashing the server. The above piece of code simply reads the reply from the client. The reply is a single message, which in our case translates to a single line of text. The mrecv function returns the number of bytes in the message. Compile the program and check whether it works as expected. At a different terminal, start a telnet session and, without entering your name, let it hang. At yet another terminal, open a new telnet session. Observe that the second session hangs without even asking you for your name. The reason for this behavior is that the program doesn't even start accepting new connections until the entire dialog with the client has finished. What we want instead is to run any number of dialogues with clients in parallel. And that is where coroutines kick in. Coroutines are defined using the coroutine keyword and launched with the go() construct. Let's compile it and try the initial experiment once again. As can be seen, one client now cannot block another one. Excellent. Let's move on. Now it's time to consider how to shut down the server cleanly. In the real-world you would have some kind of administrative user interface to ask the server to terminate. In our case we'll make it simple and just shut down the server after three clients have connected to it. Once we get out of the loop we have to deallocate all the allocated resources. For example, we have to close the listening socket. More importantly though, we are creating coroutines and never closing the coroutine handles. In fact, the previous step of this tutorial contains a memory leak: While individual dialogue coroutines finish and their stacks are automatically deallocated, the handles to those coroutines remain open and consume a little bit of memory. If the server was run for a very long time those handles would eventually accumulate and cause memory usage to go up. Closing them is not an easy feat though. The main function would have to keep a list of all open coroutine handles. The coroutines, before they exit, would have to notify the main function about the fact so that it can close the handle... The more you think about it the more complex it gets. Luckily though, libdill has a concept of coroutine bundles. Bundle is a set of zero or more coroutines referred to by a single handle. In fact, there's no such a thing as direct coroutine handle. Even go which seems to return a coroutine handle really returns a handle to a bundle containing a single coroutine. We can use bundles to solve our cleanup problem. First, we will create an empty bundle. Then we will launch individual dialogue coroutines within the bundle. As the execution of any particular coroutine finishes its stack will be automatically deallocated and it will be removed from the bundle. There will be no memory leaks. Moreover, when shutting down the server we have only a single handle the close which will, in turn, cancel all the coroutines that are still running. One thing to remember about canceling coroutines is that once a coroutine is canceled all the blocking operations within the coroutine, such as reading from a socket or sleeping, will start returning ECANCELED error. The coroutine should then deallocate all its resources and exit. Looking at our dialogue coroutine it turns out that it already does that. It responds to any error, including ECANCELED by closing the socket handle and exiting. To get some background on how object lifetimes are supposed to be managed in libdill read the article about structured concurrency. File descriptors can be a scarce resource. If a client connects to the greetserver and lets the dialogue hang without entering a name, one file descriptor on the server side is, for all intents and purposes, wasted. To deal with the problem, we are going to timeout the whole client/server dialogue. If it takes more than 10 seconds, the server will kill the connection at once. Note that errno is set to ETIMEDOUT if the deadline is reached. Since we're treating all errors the same (by closing the connection), we don't make any specific provisions for deadline expiries. Now note that the third connection to the greetserver is closed immediately without even given user a chance to enter their name. This is a common use case for network servers. When the server is being shut down we want it to stop accepting new connections, but we also want to give it some time to finish handling those connections that are still open. Suppose we want the greetserver to keep statistics: The overall number of connections made, the number of those that are active at the moment and the number of those that have failed. In a classic, thread-based application, we would keep the statistics in global variables and synchronize access to them using mutexes. With libdill, however, we aim at "concurrency by message passing", and so we are going to implement the feature in a different way. Libdill channels are "unbuffered". In other words, the sending coroutine will block each time until the receiving coroutine can process the message. This kind of behavior could, in theory, become a bottleneck, however, in our case we assume that the statistics() coroutine will be extremely fast and not turn into one. 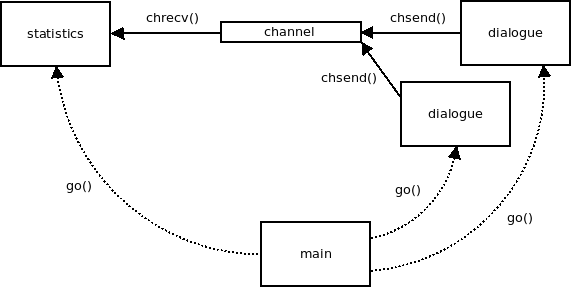 The chrecv() function will retrieve one message from the channel or block if there is none available. At the moment we are not sending anything to it, so the coroutine will simply block forever. The first line is displayed when the connection is established: There is one active connection and no connection has succeeded or failed yet. The second line shows up when the connection times out: There are no active connection anymore and one connection has failed so far. And that's the end of the tutorial. Enjoy your time with the library!